Sorry for being quiet recently, life’s been a bit up and down and that’s affecting my hobbying (not least in that I’ve somehow hurt my painting wrist so that highlighting of my latest model is taking a lot longer than I’d hoped). Once I’ve finished this guy I will move onto something a little bit simpler as a month on one Shining Spear is a bit long even for me. I picked up the Imperial Knight codex the other day. The fluff is good but it’d have been nice to have added a couple more units to bulk the army list out. We seem to be moving to a more modular game these days with Imperial Knights, Inquisition etc. adding more stuff to (Imperial) armies. Hopefully GW will branch out into the non Imperial armies sooner rather than later. I doubt that we’ll see Exodites anytime soon but I hope that whenever they bring out the Ork codex (no idea when of course) that they add a few supplements or a Grot codex or something. I quite like the new Militarum Tempestus. I’m not going to pick them up immediately but I might make a nice, fluffy little list with these guys and the Inquisition codex. The Imperial Guard (or Astra Militarum as they’re now called) has never really been my thing but these guys look kind of cool. I’m trying not to buy too much at the moment though as I’ll probably be moving in a few months and things can wait until after then. I made some scenery this weekend. We desperately needed some line of sight (L.O.S.) blocking for our games so I decided to build a hill. It took me a few weeks to find the bits. The shop where I picked up foamcore in the past has closed and our local model train shop charged more than I was willing to pay for an A2 rectangle of foam. In the end I found some, along with a bag of static grass, in a bookshop in town which has a limited art section (and the most beautiful-and pricey- model aeroplanes). It’s not a very sophisticated hill. I cut the foam with a knife as I don’t have a hot wire cutter and glued the layers together with thick super glue. I then painted it with Chrome Green acrylic paint. I couldn’t undercoat the model as the spray primer melts the foam, so I used a thick coat of cheap acrylic rather than the finer modelling acrylic, which would have required multiple coats. 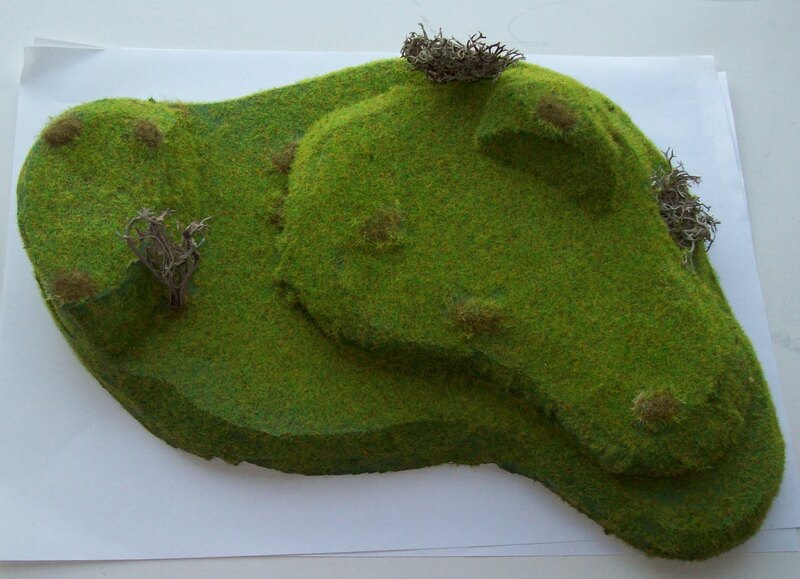 I added a few lichen “trees” and some grass tufts before smearing the whole thing with PVA glue and covering it was static grass. It’s cheap and a little bit crude but it’s a piece of all too important L.O.S. Blocking terrain that doesn’t resemble a pile of books! I need to tweak it some more but it’s a much better list (at least against Orks) than the last one. 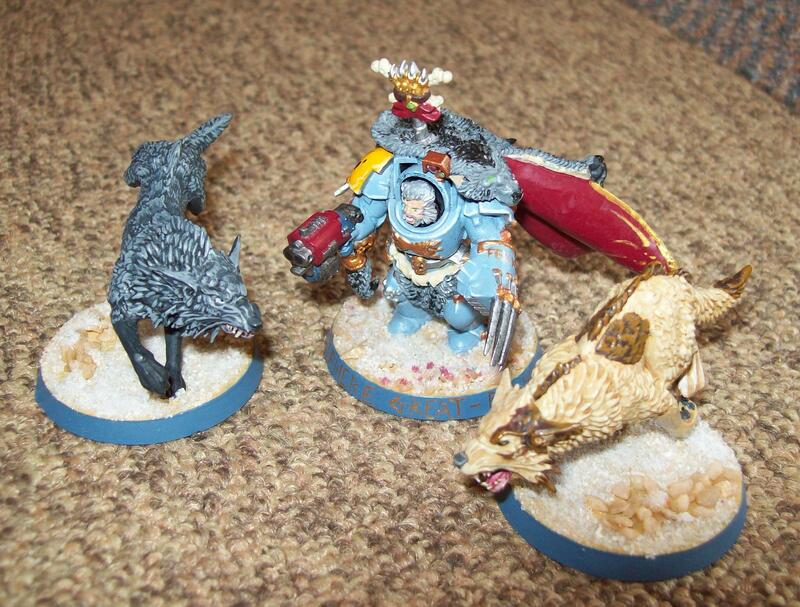 I have a slight problem in that apart from Grey Hunters, which are fine as they are, most of the usable things for Kill Team in the Space Wolves codex are too expensive for the limited points budget (Swiftclaws, Wolf Guard, Lone Wolves, Thunderwolf Cavalry) or have to be taken in fives (Wolf Scouts, Fenrisian Wolves). The game went far better for me than the last two times I played, although the Fenrisian Wolves die too easily which meant that my boyfriend’s Orks broke my army about two turns too soon. I’m going to drop them from my next list because of this, although they are good fun to use and its nice to have something that can zip across the board. If I could take fewer of them, I’d keep them in. We played the Head Hunt mission and in the end I won 6-4 on Primaries. It was a nice close game, the last time we played was a bit of a disaster for me, I’d taken Grey Hunters, Wolf Guard and Fenrisian Wolves and was then systemically taken apart by Lootas and my own dice. The Wolf Scouts really made the game for me this time, their ability to infiltrate and the 36” range of the sniper rifles more than made up for their carapace armour. I’m looking forward to the next game as I’m sure that The Other Half will have found a good counter to them. Well that’s it for now. Hopefully I’ll have something else to post about sooner rather than later! I don’t seem to have much luck with ordering products that are in stock from the Games Workshop website and my bad luck struck again when I ordered Death from the Skies for my boyfriend on Saturday. I was very surprised and gratified to receive a “sorry” voucher from GW though, normally things just turn up a week late! It was really good customer service. There’s been a lot of negative stuff about them dotting about on the internet recently (that I am NOT getting into here) so I feel that something positive like this really deserves mentioning. I’ve been doing a bit of painting recently, trying to finish my next test Night Lord so that I can paint more Space Wolves. It’s still not finished but I should finish it this weekend. The other thing that I’ve done this week is play a game. I lost badly and I’ve realised that I really need to a) learn the rules better and b) rebuild my list. 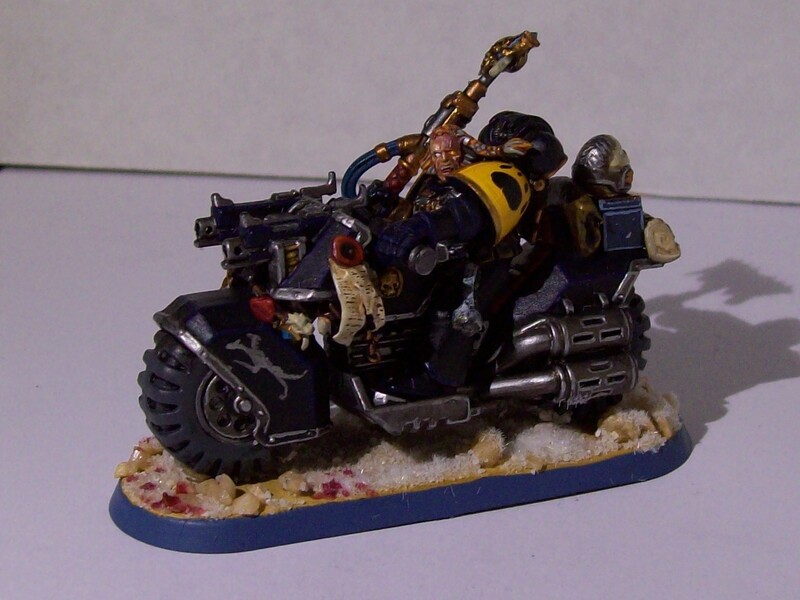 This was an “extra” HQ thanks to the Leader of the Pack rule although he ended up as Warlord. He’s fairly flexible and quite useful, unfortunately I stuck him on the wrong side of the board! I stuck him in with my star unit, the Swiftclaws, and I was really happy with how he worked. I was facing Space Marines so he didn’t have to worry about Flamers this time! HQ: Rune Priest with Chooser of the Slain. I gave him Living Lightning and Tempest’s Wrath. I really like Living Lightning but I didn’t use Tempest’s Wrath at all. I’d never actually got him into assault before and because he’s a kitbash I couldn’t figure out what his staff counted as. I ended up calling it an axe. Elites: 3x Wolf Guard Terminators. I either need to drop these guys or add to the unit. It’s too small to be effective at the moment. Elites: 5x Wolf Scouts: 4x sniper rifles, 1x missile launcher. Unfortunately, this squad is for the chop as they’re currently fairly useless. 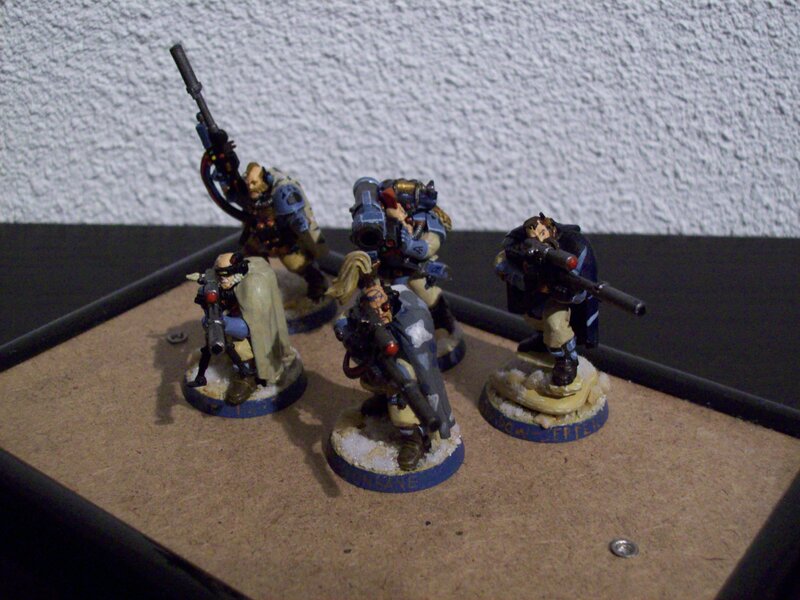 Troops: 10x Grey Hunters (1 power axe, 1 Melta Gun), 6x Grey Hunters (plasma gun), 5x Grey Hunters (power fist) . I need to run larger Grey Hunter packs and remember that they have special weapons. The smaller packs were fairly easy to wipe out. I love these guys, I just need more of them. Even Bloodclaws can operate twin-linked bolters and toughness 5 is not to be sniffed at. Heavy Support: 5x Long Fangs: 2x Heavy Bolters, 1x Missile Launcher, 1x Lascannon. The other thing that would really improve my army would be to get it out of the box more often! The game at the weekend was only my third game since sixth edition dropped. I need practice, not only to design a good list, but to get into the habit of gaming. I keep forgetting rules and, possibly even worse, I keep forgetting wargear. I made some really stupid mistakes on Saturday. Despite rolling Vanguard Strike, which gives such a small deployment zone on a 4×4 board, I managed to place my Wolf Lord on the wrong side of the board, I forgot that there was a meltagun in my list and I kept forgetting all the little rules that might have helped me. I really need more practice. I’m going to start working on models for my new improved list this weekend by painting up my latest bunch of Grey Hunters. As for practice, I guess that I’ll just have to clear off a table at home and look hopeful! So, I’m in the UK on holiday at the moment and on Sunday my boyfriend and I went to visit The Overlords. I brought along 1000 points(ish) of mostly painted Space Wolves (there was the rather embarrassing Wolf Guard terminator blue-tacked on his base while another terminator and my Land Speeder were only undercoated) while my boyfriend managed 1500 points of Daemons. My intended opponent was a bit late so I ended up playing two games. In the first I played 550 points of Space Wolves against roughly 500 points of Tyranids. I’ve only ever played Orks and Daemons before and Tyranids are another assaulty army so I was expecting to die quite quickly (again). We played capture and control on a 4 x 4 board and we used spearhead deployment. Using a 4 x 4 board rather than the 3 x 3 that we use at home (none of our tables are the right shape) for 500 points, definitely makes things easier for my Wolves as they’re not immediately thrown into assault. It’s not that Space Wolves seem to be bad in assault, it’s just that Tyranids (and Daemons for that matter) specialise in assault and don’t really do shooting and I’ve learned the hard way that you really need to thin out assaulty units before you charge them/ get charged. The first time I played with Wolf Scouts I wasn’t too impressed with them as they died very, very quickly without having much of an effect. I’m now beginning to really like them as they’re quite nice when infiltrated. They draw some attention away from the rest of the army and can plink away at the opposing army while doing so. The 36” range of the sniper rifles and the 48” range of the missile launcher are quite nice too. I feel a little bit guilty about the game as my Grey Hunters destroyed most of the Genestealers before they could assault. I did forget about my objective for a bit and around turn 4 or 5 it looked like heading for a tie. However, we rolled to continue and I’m afraid that turned the game to my favour. I don’t think that I was contesting my opponent’s objective, but he couldn’t oppose mine, which I’d finally remembered about and sat some Grey Hunters on. By this point my other opponent had turned up. I was supposed to be facing Guard, but due to a bit of a mix-up regarding cases, I ended up facing Necrons. I’m afraid I can’t remember the Necron list particularly well (except for the killyness of it). I know there were two annihilation barges, some Deathmarks, two Crypteks, a bunch of Destroyers and two squads of Necron Warriors. I think there were some Immortals too, but I’m not sure (I don’t think I’d even seen Necrons before) and I’ve completely forgotten what my opponent’s HQ was (sorry) (edit: oops- there were scarabs too!). As I’ve already mentioned, the Land Speeder didn’t really do much, but the rest of my army, although it got totally creamed, seemed to work quite well. I liked being able to use my Wolf Lord as an independent unit, as he’s quite difficult to kill and with four attacks he’s quite formidable on his own. Add the Fenrisian Wolves and he’s very useful. The Wolf Scouts were also quite useful. They do die quite easily, thanks to their light armour, but they are sneaky and can cause quite a bit of damage. However Necrons are very, very good at killing and once my guys started being shot at they began to die quite quickly. I left one unit of Grey Hunters near my objective and they remained largely intact for a few turns, but one of my Blood Claw packs met an Annihilation Barge and while they ended up assaulting it thanks to the Headstrong rule (their Wolf Guard leader had been killed), they were soon whittled down to one guy who turned out to be quite lucky (at least for a while). In the end though my guys all died, but the game was really good fun and it was interesting to play different armies. Both games were great fun and I really enjoyed them and I really enjoyed playing my opponents. It was wonderful to meet the Overlords and put faces to names and I hope that I can wander down there again some time when I next visit the UK. Thanks again guys, if you’re reading!